This is a pretty complete list of the classes I teach (but keep checking, as I'm always adding new classes!). If you would like to set up a private class with a group of friends, email me, and I would be delighted to help you out! 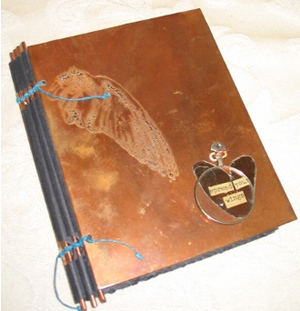 Create beautifully handcrafted, softcover books perfect for journals, recipes, notes and more. 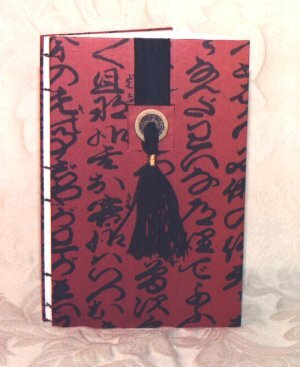 You will take home seven books including pamphlet stitched, accordion-bound and stab (Japanese)-bound books. 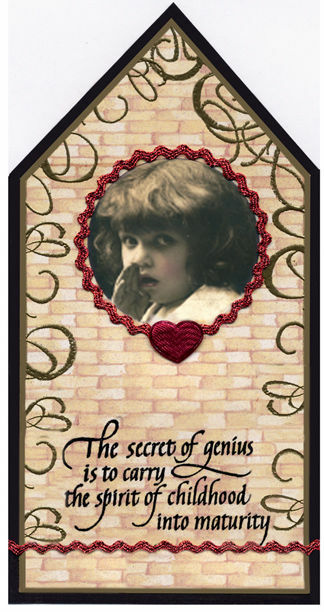 Be prepared for loads of ideas and ways to embellish your books for that special use or that special person. The cost of book materials is included in the course fee. Ask for a supply list when registering. Don’t forget a bag lunch. 6 ½ hr. 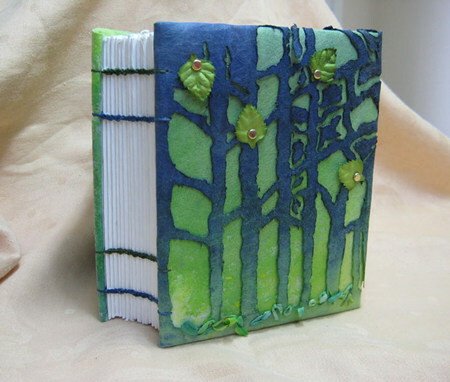 In this one day class, Suzanne will show you how to assemble books with more involved bindings, including a hard cover photo album using Japanese binding, perfect for using as a small memory album, and a multisignature book which opens flat and is perfect for a journal. 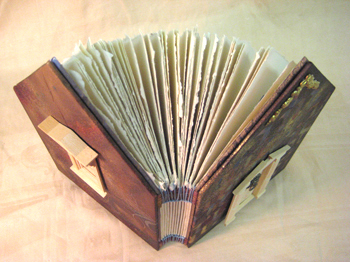 It is helpful to have had a previous bookbinding course, but not necessary. Cost of materials will be included in the course fee. Ask for a supply list when registering. 6 ½ hr. You won’t want to give these gems away! We’ll make an assortment of "charmers" that will enthrall their recipient. 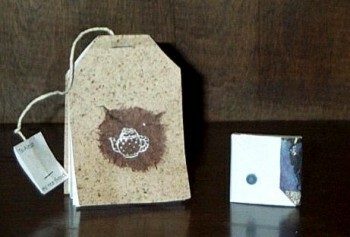 The Tea Bag book, the Pocket Accordion, a tiny book that tucks into a folded cover to close and more. Usable as a card or book, you can bring a short poem or some small photos to include or we’ll inspire you to add your own words. The cost of book materials is included in the course. Please ask for a supply list when registering. 6 ½ hr. We’re making more little gems that you won’t want to give away! 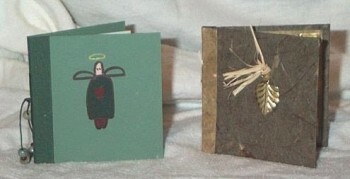 Fun to fill with small quotes, well-wishes or photos of the family, these little books will charm their recipient. A wee book that you can wear and a cool origami-fold cover book start us off. Decorate them for Christmas and they’re a precious gift that will be opened again and again. Bring along your collection of inspirational sayings or we’ll help you write your own. The cost of the book materials is included in the course. Please ask for a supply list when registering. Don’t forget a bag lunch. This is a hardcover book which will lie flat when opened and is perfect for a journal or notebook or can be alternated with photo album pages for a truly special book. 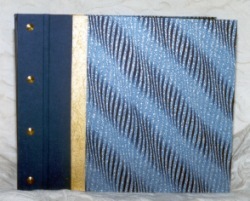 Signatures are stitched over ribbons which then appear tied across the spine when the book is completed. Please ask for a supply list when registering. What makes a book special? Details! Ribbons, beads and coloured threads. Hiding inside will be secret pockets and envelopes for storing treasures and notes. 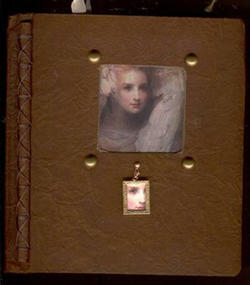 This book is perfect for mementos to recollect the birth of a child, a romantic trip to Europe or as a wedding memoir. The cost of all book materials is included in the cost of the course. Please ask for a supply list when registering. 6 ½ hr. If you can't get to the class, check out the kit on my site here! You won’t be able to resist this workshop. For the complete beginner! 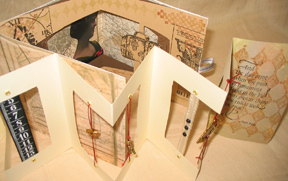 Learn to make this very special card using basic bookbinding techniques. You will be rewarded with a wee photo frame, a wee book for a love poem or a one of a kind gift to give to someone special. Tie closed with ribbon or a fancy button. 4 ½ hr. 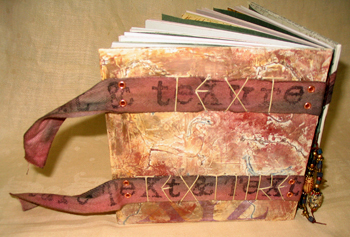 This workshop is based on a simple yet versatile accordion style binding technique. You will go home with a heart filled with inspiration…give a poem, a picture, or a pockets full of miracles a place to reside in these delightful books. What could be classier than a book with it's own case? Keep your carefully recorded memories in this precious small journal and give it a home in its own coordinating slipcase. Please ask for a supply list when registering. 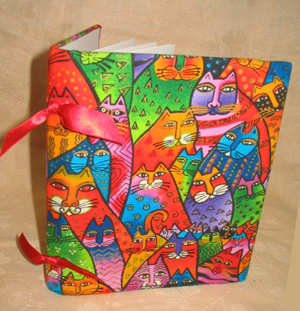 In this class we will make a hardcover journal, not too big and not too small! 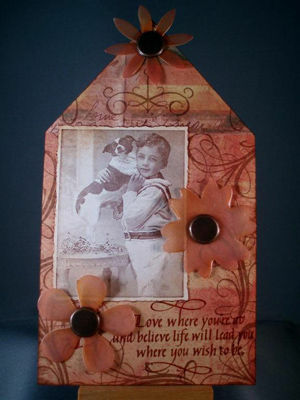 We will decorate our own paper and cut a recessed window in the front cover which can hold a charm, button, photograph or ornament of your choice. Each text page will have a lovely faux decal edge. 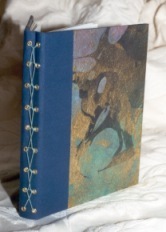 This journal has an exposed spine so you can see the stitching which adds a wonderful decorative element to an already special book. Please feel free to bring a decoration to put on cover (some will be available in the class). Please ask for a supply list when registering and don’t forget a bag lunch! 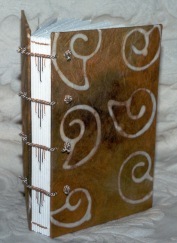 Although based on the coptic binding this book features much more interest in the exposed spine stitching. The integrated head and tail bands add a truly special finishing touch. The text pages are of heavier weight paper which allows a sturdier surface for sketching, collage, painting or just recording special moments. 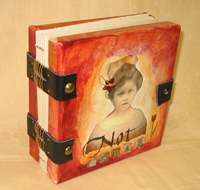 You will go home with a fabulous journal worthy of great art and words. Cost of book materials for the book made during class is included in the course fee. Extra book materials will be available for purchase at the class. Don't forget a bag lunch. 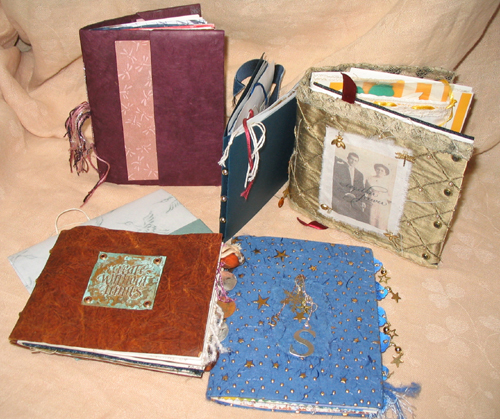 Create a scrapbook, photo album or treasured memory album. 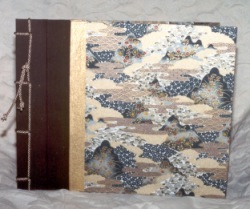 We'll use beautiful Oriental papers for the covers, rich black interior pages and delicate sheets of interleaving between each page, binding everything with rich ribbons and cords. 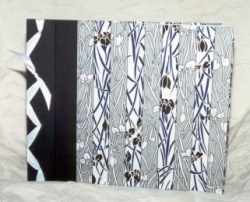 Each page can accommodate an 8 x 10 photo vertically or horizontally and you will have a choice of a few binding styles. 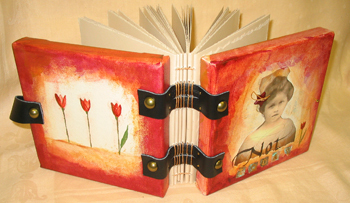 Give this masterpiece as a gift as it is, or fill it with photos as a legacy for loved ones. Cost of book materials for the book made during class is included in the course fee. Extra book materials will be available for purchase at the class. Don't forget a bag lunch! The Pipe Organ binding is stitched over cords. It looks complicated, but it really isn't! 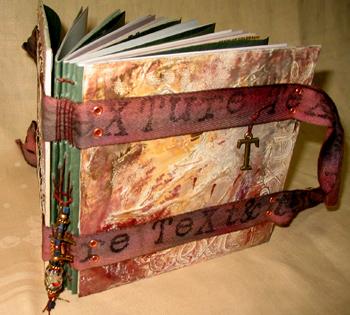 Like the Coptic stitched books, it's attractive because you don't have to worry about hinges. A variety of coloured threads can be used for the "pipes", which makes it even more versatile. 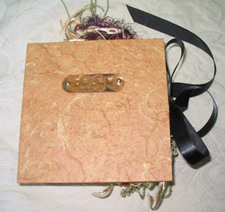 The book block is attached to the cover with the cords which are threaded through the cover. 6 hr. This amazing book will delight any viewer. 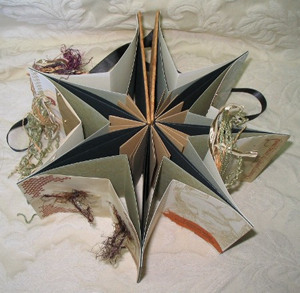 The Star book uses ties to hold it closed, but opens up completely to a spectacular star shape when folded back on itself. 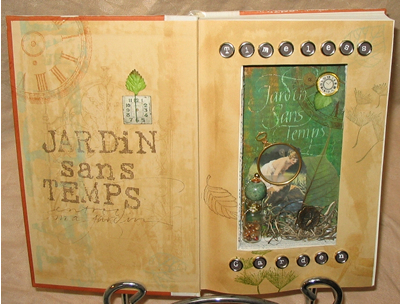 Multiple layers and colours give this book unlimited opportunities for decoration. Bring your favourite rubber stamps to decorate, or borrow those at the class. All book materials are included in the course fee. Additional kits will be available for purchase in class. Please ask for a supply list when registering. What a fabulous looking book! Is a bit more complicated than some, but nothing you can't do! Beautiful papers and coordinating bookcloth make this book a delight to the eye as well as a perfectly functional book that lies flat when open. This is a full day workshop. 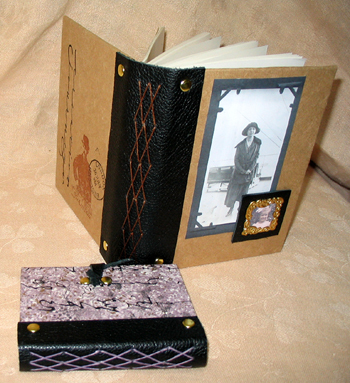 The Belgian Eyelet Book is available as a kit. This little book is based on Penny Rugs. They are made with handdyed felted wool and use the buttonhole stitch throughout. What a cutie! If I can do it, so can you! This is a fabulous book with covers of solid copper. This is a two day class. 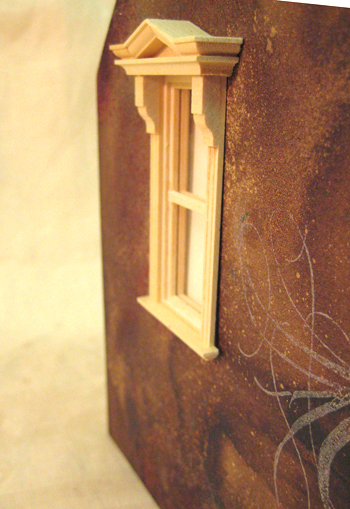 In this class we will stamp, etch, patina and drill copper and then fill the pages with the beatings of your heart. Rubber gloves if you want to try etching and some protective eyewear. I just wear my glasses. If you haven't been in a Deco round robin, you're missing out on a world of creativity! 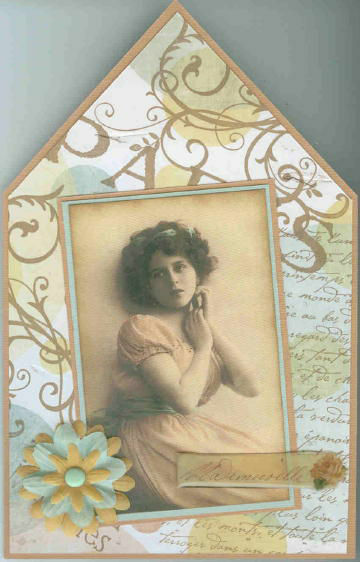 A Deco is a small book sent away to a friend who decorates a page or two, who then sends it on to another friend who also decorates your pages, and so on. When the Deco is filled it is returned to its owner. 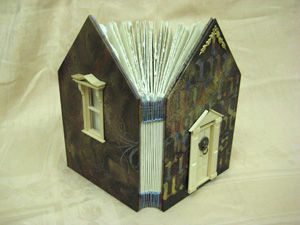 In this workshop we will make some small book structures perfectly suited to Decos. 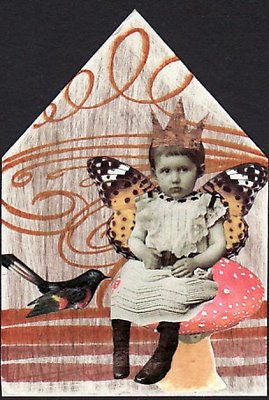 We will do some fun decoration and talk about starting a round robin of your own! 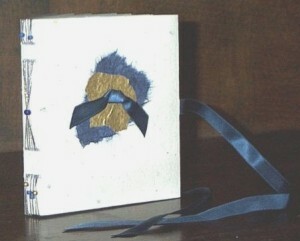 This darling little accordion book will charm anyone who sees it. 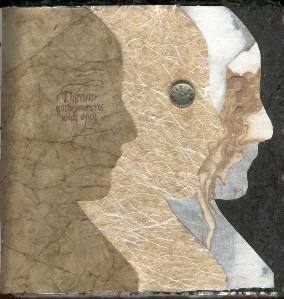 We will sandwich transparencies between sheets of mica and add delightful touches to create a very special book. This delightful book incorporates an exposed harlequin stitching pattern through a leather spine and incorporates rivets into the structure. 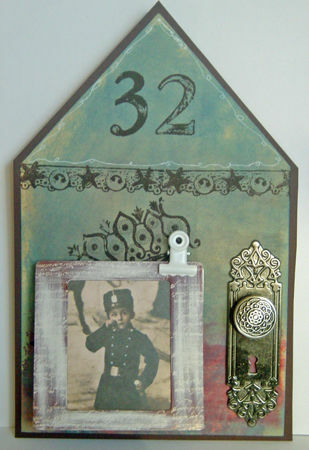 You may decorate your book with a copy of an old photo and add other embellishments if you wish. The cover of the book we will be making is class is approximately 8 1/2" tall by 5 1/2" wide. In this workshop we will use a rich and varied selection of papers to assemble a journal that will fascinate the owner before it is even filled! 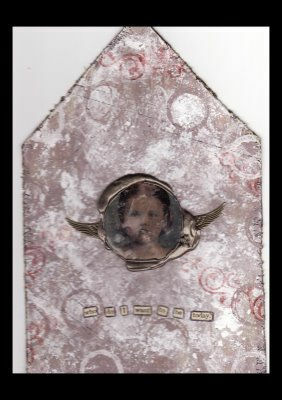 The cover will be decorated using techniques that will give wonderful texture embedded with intriguing inclusions. 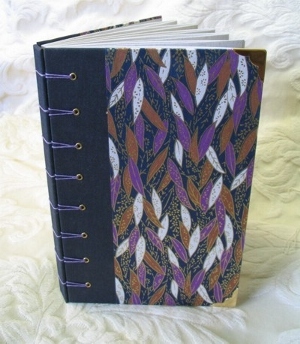 The pages will be bound by stitching over hand dyed and stamped straps which are eyeleted through the cover. Join us as we create this intriguing book which opens into pages of unfolding adventures. 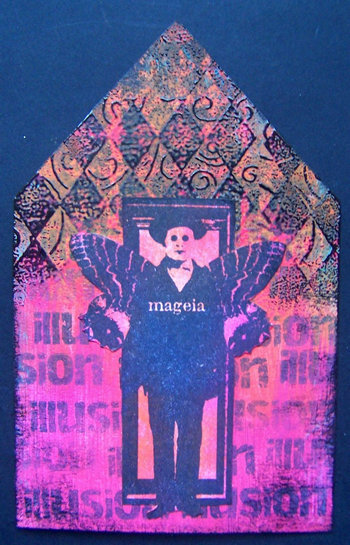 Each section becomes a structure providing opportunities for your creative spirit to play. We will make interlocking accordions, open accordions, fun folds and more, all wrapped in a neat little cover. This book will be a delight to hold and treasure or to give to a lucky special person! 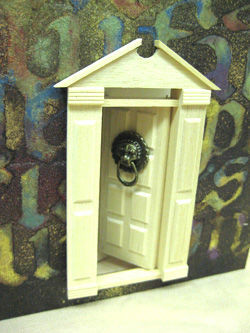 Miniature Windows and Doors are not provided with the class kits, but may be purchased separately. We're going to create a wonderful book shaped like a house! 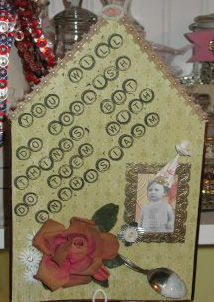 We'll look at the many ways you can decorate your creation as well as learn the Buttonhole Stitch Binding. 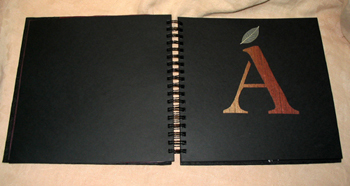 Use it afterwards for a journal or a guest book. Bring home related quotes and rubber stamps if you have them! 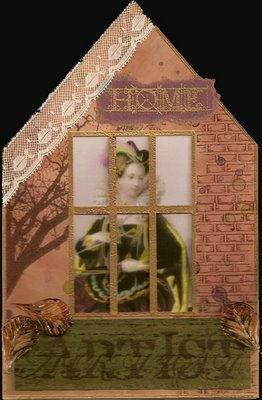 In February 2008, the Created byhand Tuesday Challenge was to decorate the template for the cover of the Home Sweet Home Journal. Here is how some very talented artists would decorate their houses. A big thanks to them for sharing! Click on each photo to see it larger. What do you get when you take canvas and paper, a few toys and photos and a few techniques? You get the Caught in Canvas Journal. 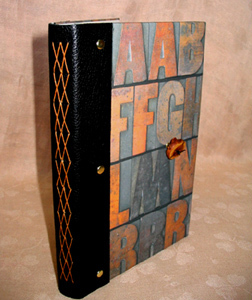 We'll create a fun and intriguing journal that is set apart from all the rest! Please bring small 3D items no larger than 3" tall or wide (smaller is better) that might have a theme such as friends and family or seaside. In this workshop we get to experiment with a variety of techniques using Lutradur! Lutradur is a spun bond web material manufactured by Pellon that is very strong yet flexible. 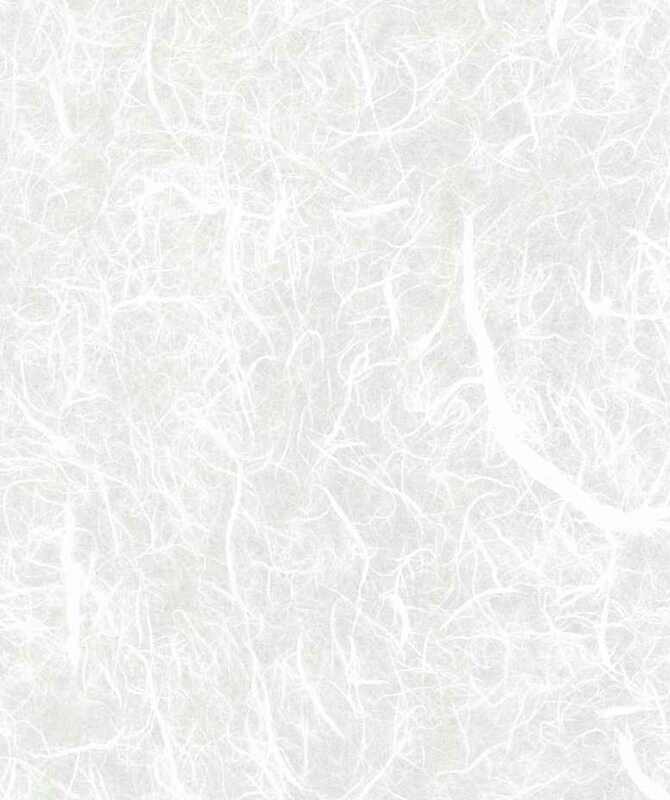 It has an open structure and accepts paint, ink, and other materials which interact with a surface that is delicate enough to filter light. It can also be stitched, burned, foiled and embellished! 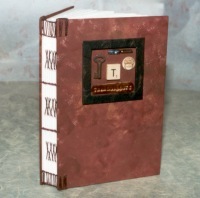 Our chubby little journal will be approximately 5 ½" x 4 ¼" with about 160 pages. All book materials will be supplied (including Lutradur), as well as some paints and crayons. Please ask for a supply list when registering! 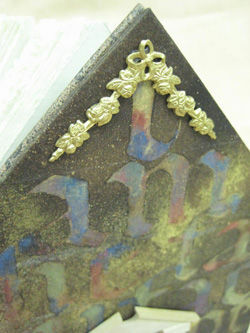 Ruler with metal edge - at least 12"
What is an Altered Book? Consider it a recyling project for saving books from the landfill! 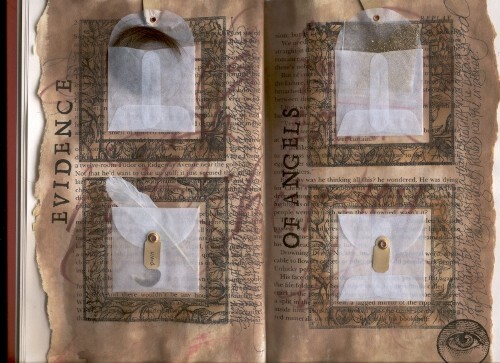 In this class we will take a book and begin the altering process, breathing new and personal life into the pages. 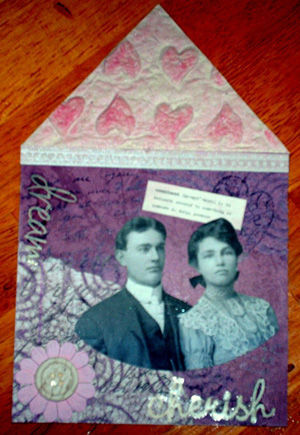 We will focus on many methods of altering, including incorporating envelopes, fibres, folded pages, niches and more. Fast-drying acrylic paints will be utilized throughout the class. Our theme will be friends and family. Some supplies will be provided, but please bring a pencil for marking and note-taking, your favourite quotations, rubber stamps and pads, copies of old family photos, any eyelets, brads and embellishments you may have and your experimental spirit! You will also need a book to alter. To start, I suggest a modern hardcover novel of approximately 200-300 pages, in which the pages are sewn in (not glued) and are not glossy. 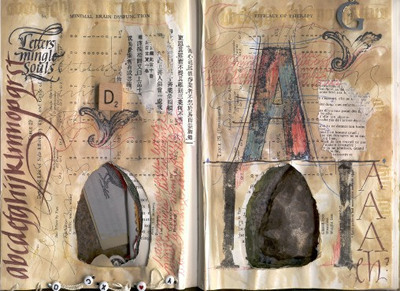 "In creating, the only hard part's to begin"
Adding the written word to an altered page is of particular interest to many artists. The nature of a book is, in it's original creation, a collection of papers filled with words and illustrations. Sometimes during the altering process we wish to add additional words. It's so exciting when you find that perfect quotation. Your next challenge is to get that quote down on the page. 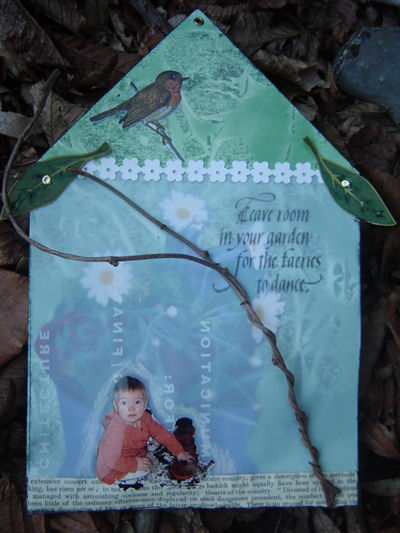 In this workshop we will explore a variety of methods for getting words on your altered page, adding text and texture as a feature element, or to compliment other artwork on the page. We will play with some letter styles as well as vary size and letter proportions to see how this affects visual impact on the altered page. 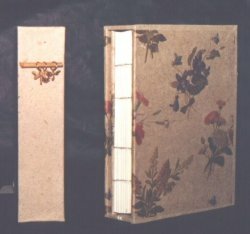 We will incorporate envelopes, fibres, tags, folded pages, beads and niches to our books and explore a variety of other altering techniques. Using friends and family as a theme for your book provides an excellent place to begin, although you may choose any theme that strikes your fancy - or none at all! You will need at least one book to alter. I suggest a modern hardcover novel of approximately 200-300 pages, in which the pages are sewn in (not glued) and are not glossy. It does not have to be a very old book or even have a title that "speaks" to you, but that can be a bonus! You will receive a recommended supply list upon registration, but think about bringing colour copies of photos that are appropriate to your theme as well as favourite quotations. Come with your experimental spirit! If you've never altered before, this is a great place to start! You may wish to bring your own stash of brads, eyelets and embellishments although almost everything you need of that type will be available in class. · Ruler with metal edge - at least 12"
· a heat gun - even a hair dryer would speed up some things! · Water pots, several - eat yogourt! 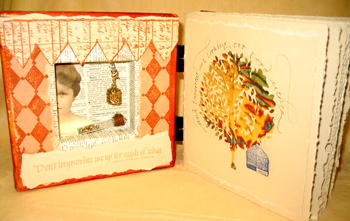 In this altered book class, we will create niches and drawers in our altered books. Please bring 2 or three books to alter. A good choice is a contemporary hardcover novel of about 300 pages. 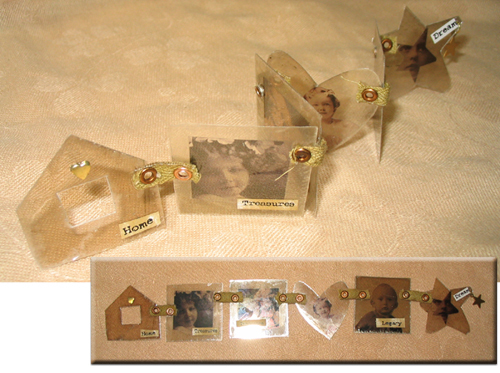 Also bring copies of old photos that you might like to use and any charms, buttons or embellishments that you might wish to use. If you are not familiar with altering books….. Consider it a recyling project for saving books from the landfill! 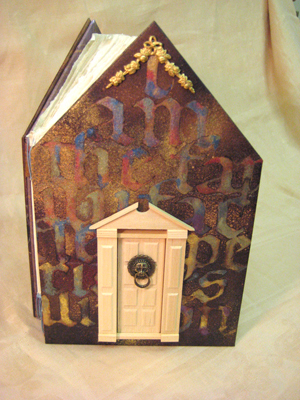 You will take a book and alter it by painting, collaging and embellishing and cutting. 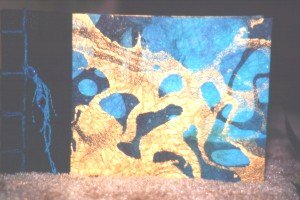 You will breathing new and personal life into the pages and create artwork that is unique and all yours! You will have a great time with this project. This is a one day workshop. Artist's Journal in a Day - No Fear! Everyone needs a book of their own. 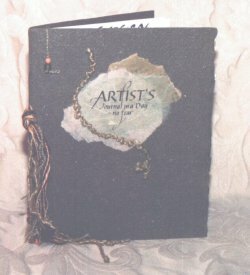 Every artist absolutely needs a book of their own. A book to explore creativity, a book you can share or keep private or a sampler where you can simply keep it all together! Sometimes beginning a new book can cause great anxiety… You don’t want to wreck a beautiful new book! This workshop guides you through the construction of the book and many exercises, as you fill your pages with drawings, collages, writing exercises and inspiration designed to spark your creative spirit. 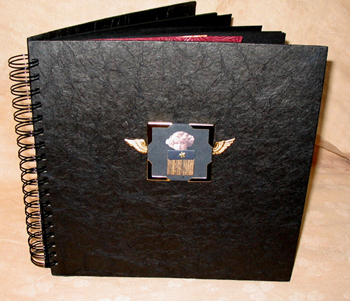 Each participant comes away with their own unique treasure; a book of their very own. Although this workshop can be done in an extremely fast-paced day, it is better as a two-day workshop! Extra time set aside is cherished time for creative freedom. If you would like more information and photos from this workshop click here. 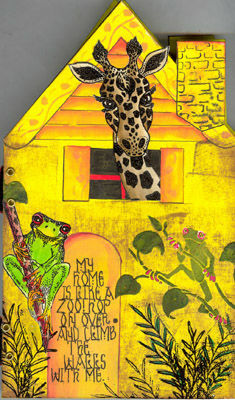 Don't you just love going through a hand-decorated journal and wishing you could have one, too? Now is the time to start! Let's take some luscious handmade papers and use some fun and creative techniques to get you started on your very own journal. Soon you'll be off and on your way to owning a fabulous book to be treasured! Black pages are amazing! They have such an inherent and elegant formality. Decorative paper colours "pop" on black and the smooth text pages accentuate the fabulous textures of the handmade papers. 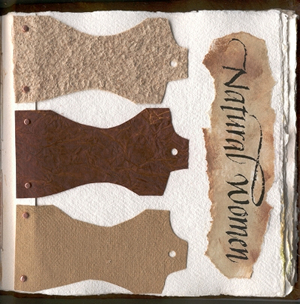 The designs in this book show how you can create beautiful, stylish pages easily and quickly with basic techniques and only a few embellishment, yet keep that "altered" look that's a little off the beaten track. 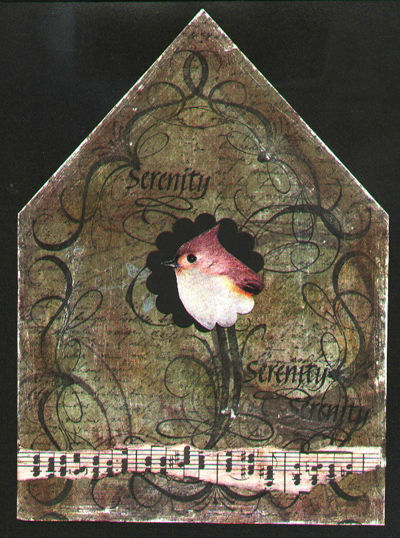 Using the fabulous papers from Select Imports we will stamp, paint, tear and assemble unique pages that will thrill any viewer. 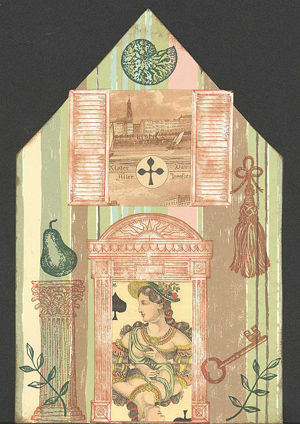 The images on this site are the property of Suzanne Cannon. Use without the permission of the owner is absolutely prohibited. For information about these images please contact us.